Beacon Hill, one of Boston's most charming and unique neighborhoods, is comprised of small gas-lit streets lined with beautiful examples of period architecture of all shapes and sizes. The buildings intersect each other, creating an ambiance reminiscent of Dickens novel. Beacon Hill encompasses an area which is bordered on the North by Beacon St., which runs up the hill along the perimeter of the Boston Common to the State house. The State House was designed by Charles Bullfinch in 1797 and is one of the finest examples of his work. The "Flat" of the hill runs down to the banks of the Charles River, where in the summer one can hear the music of Boston Symphony Orchestra from the Hatch Memorial shell on the banks of the Charles. The bottom of the West slope of the Hill is bordered by Cambridge St, which is currently undergoing a major restoration by the city. Charles St. is the main shopping thoroughfare and is lined with quaint stores and antique shops. Because of its proximity to the Massachusetts General Hospital and the Boston Eye and Ear Infirmary, Beacon Hill counts many members of the medical community among its population. There are also many families who have occupied entire townhouses for several generations, as well as a sprinkling of students who seek out affordable apartments in some of the smaller buildings. The geography, architecture, and local color provided by the residents make the Beacon Hill neighborhood a rare gem. Bay Village is an historic gem of meticulously restored smaller replicas of the grand mansions of Beacon Hill, which were built by the stonemasons and carpenters of the day to house their own families. A walk through this unique neighborhood is like a step back in time. Bay Village consists of Federal-style, Greek Revival and Victorian rowhouses on six square blocks. This close-knit and diverse community is bordered by its sister neighborhood, the South End, and the Theater District and is steps to the Boston Common, the Boston Public Garden and some of the city's best restaurants and entertainment. Public schools: Boston Renaissance Charter School. Cultural/recreational: Seaman's House, Wang Center, many theaters. Cambridge is located just a bridge away on the other side of the Charles River. Packed with international flair and a youthful vitality, Cambridge is a city where counter-culture still lives, classic culture thrives, and multicultural is a way of life. Home to two of the world's finest educational institutions, Harvard University M.I.T., Cambridge is also home to many bookstores, boutiques and cafes. As a captivating, off-beat alternative to Boston, the "Squares" of Cambridge are charming neighborhoods rich in adventurous dining options as well as unique shopping, theatres, museums, and historic sites. Located between the academic powerhouses of Harvard and MIT, Central Square is the seat of City government and is home to a rich variety of international restaurants and music clubs. Harvard Square, located around the historic brick walls of the country's oldest university, is a mecca for dining, shopping, books, and entertainment. Historically, Inman Square is a bustling shopping district and today, is home to a bounty of unique restaurants offering cuisine of unparalleled excellence and diversity. Just a bridge away from Boston's Beacon Hill neighborhood, Kendall Square is home to MIT and the heart of Massachusetts' booming high tech and biotechnology industries. In north Cambridge, Porter Square boasts the region's largest concentration of Japanese eateries and shops including a popular Japanese bookstore. Schools: Cambridge Public Schools; Cambridge Ringe & Latin High School; The Shady Hill School; Buckingham, Browne and Nichols School; Cambridge College; Harvard University; Lesley University; Longy School of Music; Massachusetts Institute of Technology. Brookline was founded in 1705 and offers many different small neighborhoods with shops, restaurants, pubs, large estates, apartment complexes and beautiful open land. Brookline is home to some of the world's best medical institutions and is home to many academics and medical professionals, college students, families and immigrants. Brookline is home to the oldest country club in the United States, in addition to having its own working farm, a town golf course and magnificent parks. Many different pedestrian-friendly areas offer a variety of bookstores, antique stores, clothing shops, restaurants and cafes, delis, fresh fruit and vegetable markets, and coffee shops. Brookline is a very short distance from Boston and offers the best of both the city and the country, thus making it a jewel of a suburb. Cultural/recreational: Coolidge Corner Theater, Brookline Arts; John F. Kennedy birthplace; many parks, golf course, Brookline Country Club. The Fenway is a densely populated neighborhood in which 35,000+ people live in 1.24 square miles nestled among a number of large educational institutions, hospitals, and world-renowned cultural institutions. Within it are five sub-neighborhoods: Audubon Circle, East Fenway, Kenmore Square, Longwood, and West Fenway. Home of the Boston Red Sox, the Fenway is comprised of a wide variety of people including professionals, families and students. The Financial District of is located in the downtown area near Government Center and Chinatown. It is roughly bounded by Atlantic Avenue, State Street, and Devonshire Street. This area is home to corporate headquarters and the financial industry, including such structures as Post Office Square, South Station, the Exchange Place and International Place complexes, and the landmark Custom House Tower. City Hall and Government Center border the Financial District. The historic Freedom Trail links the Financial District with sixteen of the city's most historic sites from the past two and a half centuries. The Financial District buildings range from skyscrapers to quaint brick buildings erected in the 18th and 19th centuries. Housing ranges from high-rise apartments offering panoramic views to converted loft condominiums. Also in the area are nearby Faneuil Hall and Haymarket, both of which offer many stores, restaurant, fresh fruit and vegetable markets and many entertainment options. The Leather District is a dynamic urban neighborhood bordered by Chinatown and the Financial District. It consists of only three main streets, Atlantic Ave, South Street and Lincoln Street, which are intersected by a few side streets. The historic brick buildings with cast-iron storefronts were originally industrial structures used for leather tanning and shoe manufacturing. South Station, Boston's largest train station and home of Amtrak, borders the Leather District on Atlantic Ave.
Today, the Leather District is popular for loft condominiums offering wide open spaces, exposed brick, hardwood or concrete flooring and exposed ductwork. The Big Dig has re-routed traffic and has transformed this neighborhood into a destination for hip nightlife and restaurants. The future Rose Kennedy Greenway will be located adjacent to the Leather District and connect it to the North End and Waterfront neighborhoods. Some of the city's most beautiful architecture lines the streets of the Back Bay. The Back Bay, the body of water separating Boston from Brookline, was filled in the mid-1800's, adding 450 acres of land to the city of Boston. The magnificent Victorian mansions were first occupied by some of Boston's most prominent families. In the 1950's and the 1960's, the heirs sold off their properties and many of the brownstones were converted into rooming houses and student apartments, or stood unoccupied. 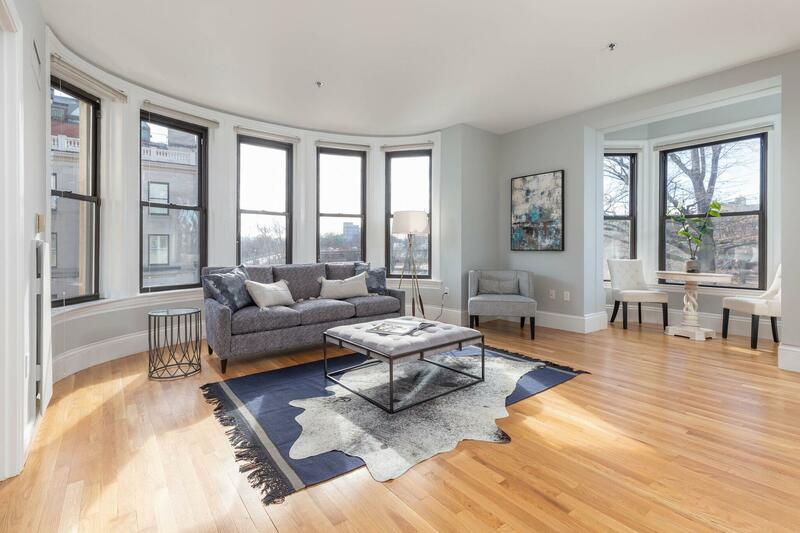 In recent decades, this trend has been reversed and this chic neighborhood is now Boston's showpiece, crowned by the beautiful Victorian Boston Public Garden. On Beacon St., brownstones on the north side look over the Charles River to Cambridge on the other side, and have the Esplanade practically in their back yard. Marlborough Street holds the most distinct old-world flavor as it is the narrowest. The gas lamps that light the street glow with a sense of history. Commonwealth Avenue, with its tree-lined grassy mall running down the center, is lined with beautiful examples of 19th century architecture and magnolia trees and truly rivals the most beautiful boulevards in the world. This upper class area, whose gas-lit streets are often quiet, is one of the city's most beautiful residential neighborhoods. Multi-family homes and condominiums line the streets of this welcoming neighborhood, which is located in the northwest corner of Boston, on the shores of the Charles River. Many of Brighton's small businesses are located along Washington Street, which runs straight through Brighton Center to Oak Square. The Brighton Center Main Streets Program has been actively attracting new businesses to the neighborhood, as well as offering grants for storefront renovations. St. Elizabeth's Hospital and the Franciscan Children's Hospital also call Brighton home. Families, young professionals and graduates students are all lured to Brighton for its tranquil yet dynamic atmosphere. Historic homes and “triple-deckers” line the streets of this charming neighborhood, which offers a small town feel with big city amenities. One of the best activities in Brighton is people-watching. You'll find an exciting mix of ethnicities and age groups, from upper middle class college kids to Vietnamese immigrants to the local Russian community. Families, young professionals and graduates students are all lured to Brighton for its tranquil yet dynamic atmosphere.